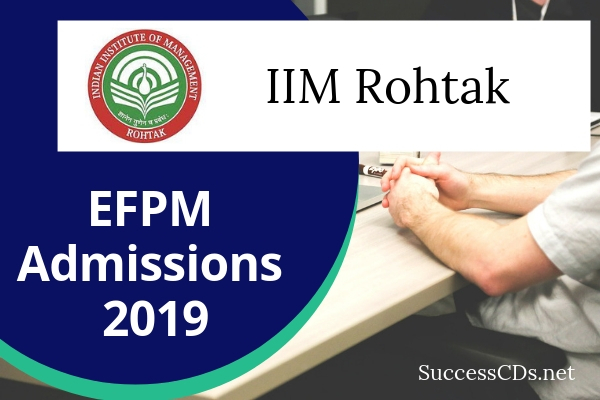 IIM Rohtak Integrated Program in Management Admission 2019 - Indian institute of Management (IIM) Rohtak invites application for admission to 5 years Integrated Program in Management (IPM) for the academic session 2019-20. IIM Rohtak with an aim to develop managerial and leadership skills among the young students has launched Five-Year Integrated Program in Management (IPM) with effect from academic session 2019-20 for the students who have completed their class XII. The program will help the young students who aim to pursue their career in Business Management after class 12. The program consists of 15 terms spread over a period of 5 years. A year has three terms, each of 3 months duration. The entire program is divided into two parts; the first part focuses on the foundation courses, whereas the second part focuses on the management. Students require to undergo internships at the end of every academic year. On successful completion of 5 years, the participant will be awarded with Masters of Management Studies (MMS) by IIM Rohtak. If any student intends to exit after successfully completing the program requirement at the end of 3 years, he/she will be awarded with a degree of Bachelor of Management Studies (BMS). IIM Rohtak shall admit around 160 students for the first batch of 5 year IPM program. Interested applicants will fill the registration form that aims at evaluating applicant’s proficiency in academics as well as in extra-curricular activities. All the interested applicants will undergo IIM Rohtak’s IPM Aptitude Test that will examine the aptitude, logical reasoning and proficiency in English of the applicant. The program fees for the resident Indians for the first three years of the IPM program is Rs. 4,10,000/ - per annum and Rs. 6,20,000/- per annum for international applicants. The program fee for the 4th and 5th year is as per the prevailing program fees of PGP Program at IIM Rohtak. IIM Rohtak shall admit around 160 students for the first batch of 5 year IPM programme. The 5 year IPM curriculum at IIM Rohtak consists of 15 terms spread over a period of 5 years. One year has three terms, each of 3 months duration. The entire programme is divided into two parts; the first part focuses on the foundation courses, whereas the second part focuses on the management. Students will be undergoing internships at the end of every academic year. IPM curriculum has 4 core areas: Mathematics, Economics, Statistics, and Humanities. Courses offered at the PG level (4th and 5th Year) will be the same as per the PGP curriculum.